Langerhans cell histiocytosis (LCH) is rarely encountered in ophthalmology practice. It is a spectrum of disorder characterized by accumulation of histiocytes in various tissues. Diagnosis is challenging as it may simulate periorbital hematoma, rhabdomyosarcoma, and neuroblastoma. We report a case of unifocal LCH with orbital extension. Diagnosis was obtained from incisional biopsy, and histopathological examination showed numerous histiocytes with eosinophilic infiltrations. The presence of Langerhans cells was confirmed by the presence of protein S-100, CD1a, and/or Langerin (CD207). Treatment depends on the degree of organ involvement. She responded well to cytotoxic drugs and steroids. This emphasized that prompt tissue diagnosis is crucial for early management. Langerhans cell histiocytosis (LCH) is a rare disorder of mononuclear phagocytic system, which was first described by Alfred Hand Jr. in 1983. It was later classified as “Histiocytosis X” by Lichtenstein in 1953. LCH then derived its name in 1987, when Nezelof et al. identified the Langerhans cell as predominant pathologic cell. LCH is considered to be a Class I histiocytic disorder with dendritic-cell-related disease. LCH is most commonly diagnosed in the childhood with annual incidence of approximately 4.1 per 1 million children per year. LCH primarily affects the skeletal system. The osseous lesion site is a variable form of skull bone, facial bone, femur, spine, pelvis, humerus, tibia, clavicle, rib, and scapula. An appropriate stratification of the disease depending on the extent and localization of the disease at the time of evaluation is necessary to plan an adequate therapeutic approach. 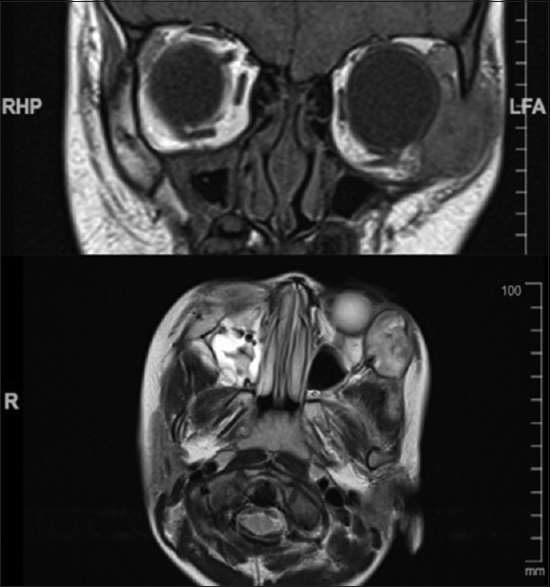 This article describes a rare case of unifocal LCH in the maxillary and zygomatic bone with orbital extension discussing the diagnosis, radiographic and immunohistochemical aspects, and treatment. 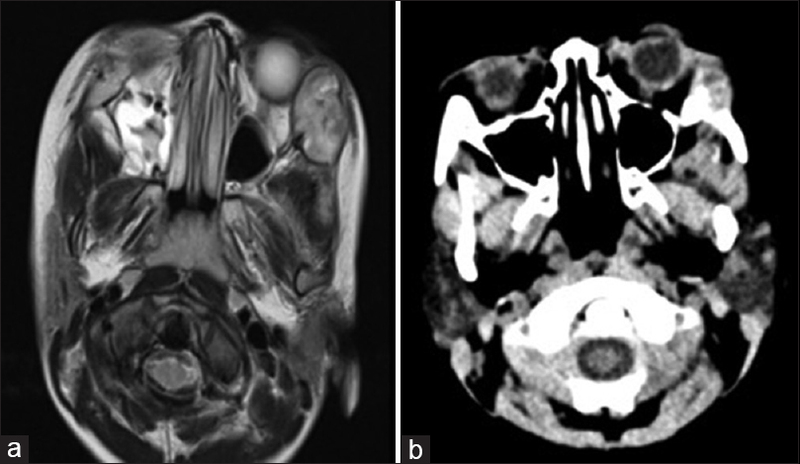 A previously healthy 3-year and 4-month-old Chinese girl presented with a 6-week history of diffuse left periorbital swelling. The swelling progressively increased in size for 2 weeks duration. There was no blurring of vision, history to suggest ophthalmic infections or history of preceding ocular trauma. Systemic reviews were unremarkable. Visual acuity with Kay picture test were 6/6 OD and 6/9 OS. Hirschberg test showed central corneal reflexes. Both ocular movements and pupil examinations were normal. There was no proptosis. Slit-lamp examination of the anterior and posterior segments was unremarkable. The periorbital bluish mass located at the left lateral canthal area, measuring 3 cm (vertical) and 2 cm (horizontal) in size. It was hard in nature, adhered firmly to underlying bone, not adhered to overlying skin, nontender, and nonpulsatile. Systemic examinations were unremarkable. No cranial nerve abnormalities were detected. Laboratory examination revealed a normal full blood count, liver enzymes, and chemistry profile. The water deprivation test taken after the pathologic diagnosis was negative. Magnetic resonance imaging of the orbit [Figure 1] showed left orbital rim lesion with bony destruction involving the frontal process of left zygomatic bone measuring 2.8 cm × 2.2 cm × 2.1 cm. The mass extended into the left lateral rectus muscle and left lacrimal gland. Periosteal reaction was noted over the left maxillary bone. No other lesions were observed. A bone scan revealed areas of increased tracer uptake at the left zygomatic and left maxillary bone. There was no osteolytic bone lesion from a complete skeletal radiograph survey and no evidence of metastases from computed tomography (CT) of the thorax, abdomen, and pelvis. Our initial provisional diagnosis for this patient was rhabdomyosarcoma as it is the most common primary orbital malignancy in children, keeping in mind of neuroblastoma, leukemia, and pseudotumor as our differential diagnosis, thus a biopsy was arranged. 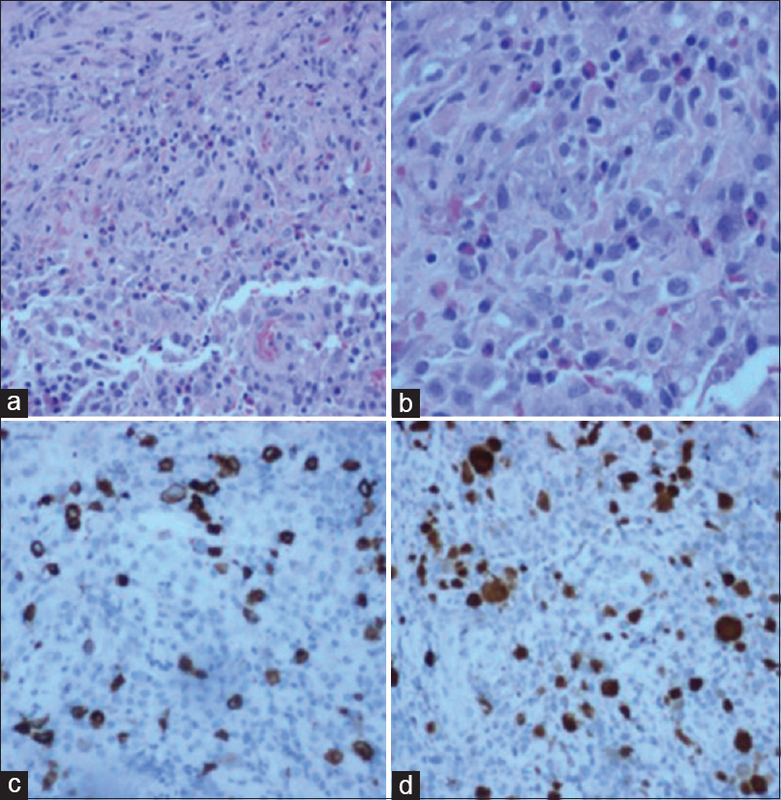 Due to lack of expertise, an incisional biopsy through a subciliary incision was performed [Figure 2], and histopathology examination [Figure 3] showed fibro-collagenous tissue and skeletal muscle fibers infiltrated by predominantly eosinophils, histiocytes (CD68), hemosiderin-laden macrophages, lymphocytes, and plasma cells. Mildly atypical cells resembling Langerhans cells, exhibiting vesicular and angulated nuclei, visible nucleoli with irregular nuclear membrane and no evidence of malignancy. Immunohistochemistry confirmed that these atypical cells were positive for protein S-100, CD68, and CD1a antigenic determinants. They are negative for PLAP, ALK1, and myogenin. Ki67 index was low indicates of low mitotic figure. Hence, a diagnosis of LCH was made. She was treated with 12 cycles of chemotherapy (vinblastine 6 mg/m2) along with systemic corticosteroid. Chemotherapy was given from bone scan; the tracer uptake involved the left zygomatic and maxillary bone. After six cycles of chemotherapy, she showed tremendous improvement clinically and radiographically [Figure 4]. Currently, she was followed up every 3 months for the past 2 years. Latest CT brain showed resolved left zygomatic lesion. LCH is still on debate whether it is a true neoplasm, an atypical immunoreaction, or an inflammatory condition. A multitude of clinical manifestations of LCH has been described in the literature depending on specific organ involvement from the localized solitary disease to a fulminant multisystemic manifestation. Furthermore, orbital histocytosis must be differentiated from other orbital histiocytic disorder such as Ewing's sarcoma, osteomyelitis, juvenile xanthogranuloma, and bone metastases. This diverse clinical symptomatology inadvertently leads to its misdiagnosis and consequently, late treatment and poorer prognosis. LCH is further classified into two categories which are single-system and multisystem disease. In single-system LCH, it is further divided into unifocal (single lesion on bone, skin or lymph node) or multifocal (multiple lesions on bone or multiple lymph nodes). In multisystem LCH, the disease affects two or more different organs, with subdivision into low-risk or high-risk groups depending on the absence or presence of involvement of liver, lungs, spleen, or hematopoietic system. In this case, she had orbital LCH with unifocal involvement. Orbital involvement in LCH is relatively uncommon, ranging from 1% to 25%. The mass occurs predominantly in the superior or superolateral orbital roof and often exhibits other features depending on the location of the Langerhans cell infiltrate due to mass effect. It may present as a periorbital swelling, proptosis with mechanical ptosis if located in the anterior orbit, therefore, may be misdiagnosed as periorbital hematoma, periorbital cellulitis, rhabdomyosarcoma, inflammatory pseudotumor, leukemia, sarcoma, and neuroblastoma. 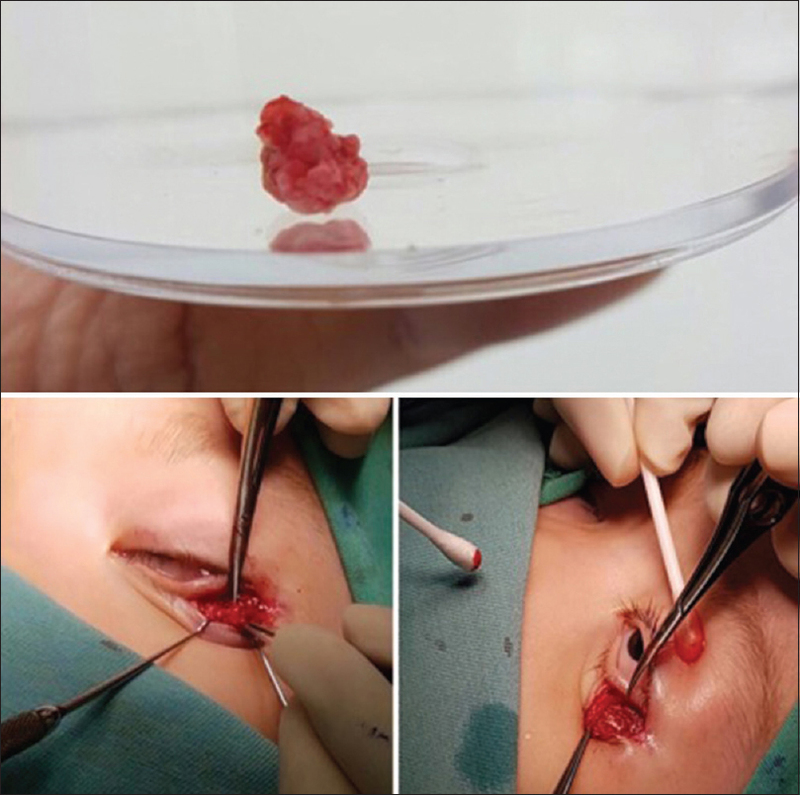 As this orbital swelling has wide range of differential diagnosis, a tissue biopsy was taken in order to aid with the diagnosis before further management was taken. The objective criteria for the diagnosis of LCH is the morphologic identification of the characteristic LCH cells as defined by the Histiocyte Society. This can be proven by a biopsy. Incisional and excisional biopsies are preferred over fine-needle aspiration biopsy because the latter might not provide enough material for a sufficient histologic diagnosis. As her mass was easily palpable at the lower lid, incisional biopsy through a subcilliary incision was performed ensuring adequate sampling and minimizing the complications, if the biopsy was to be taken from another deeper site. Definitive diagnosis requires morphologic identification of the characteristic LCH cells, with abnormal proliferation of histiocyte-like cells associated with eosinophil, lymphocyte, and macrophage infiltration. The immunohistochemical evaluation is an ancillary tool and revealed a positive reaction to S-100, CD1a, and/or Langerin (CD207). Several studies demonstrated an association between the orbital involvement and development of diabetes insipidus/central nervous system (CNS) disease. Patients with extended orbital and periocular involvement may be more likely to develop diabetes insipidus, as in our patient, but she nonetheless had a negative water deprivation test. Pediatrician plays a role for long-term surveillance to detect late complications of the disease and treatment monitoring. There is a wide umbrella of causes of periorbital swelling in a child, and a high index of suspicion is entailed for the timely diagnosis and correct management. Incisional biopsy allows for a histopathological diagnosis and may be even curative in some cases if extended to excisional biopsy with bony curettage. A multidisciplinary approach is essential for multisystem disease. Long-term surveillance is advisable to adequately diagnose, anticipate CNS risk lesion, treat recurrences, and detect late complications. Margo CE, Goldman DR. Langerhans cell histiocytosis. Surv Ophthalmol 2008;53:332-58. Nezelof C, Basset F, Rousseau MF. Histiocytosis X histogenetic arguments for a Langerhans cell origin. Biomedicine 1973;18:365-71. Stålemark H, Laurencikas E, Karis J, Gavhed D, Fadeel B, Henter JI, et al. Incidence of Langerhans cell histiocytosis in children: A population-based study. Pediatr Blood Cancer 2008;51:76-81. Rivera JC, Wylie E, Dell'Orfano S, Mooney R, Hensley MA, Carry P, et al. Approaches to the treatment of unifocal Langerhans cell histiocytosis: Is biopsy alone enough? J Pediatr Orthop 2014;34:820-4. Vosoghi H, Rodriguez-Galindo C, Wilson MW. Orbital involvement in Langerhans cell histiocytosis. Ophthal Plast Reconstr Surg 2009;25:430-3. Histiocytosis syndromes in children. Writing group of the histiocyte society. Lancet 1987;1:208-9. Harris GJ, Woo KI. Eosinophilic granuloma of the orbit: A paradox of aggressive destruction responsive to minimal intervention. Trans Am Ophthalmol Soc 2003;101:93-103. Lau SK, Chu PG, Weiss LM. Immunohistochemical expression of Langerin in Langerhans cell histiocytosis and non-Langerhans cell histiocytic disorders. Am J Surg Pathol 2008;32:615-9. Imashuku S, Kinugawa N, Matsuzaki A, Kitoh T, Ohki K, Shioda Y, et al. Langerhans cell histiocytosis with multifocal bone lesions: Comparative clinical features between single and multi-systems. Int J Hematol 2009;90:506-12.